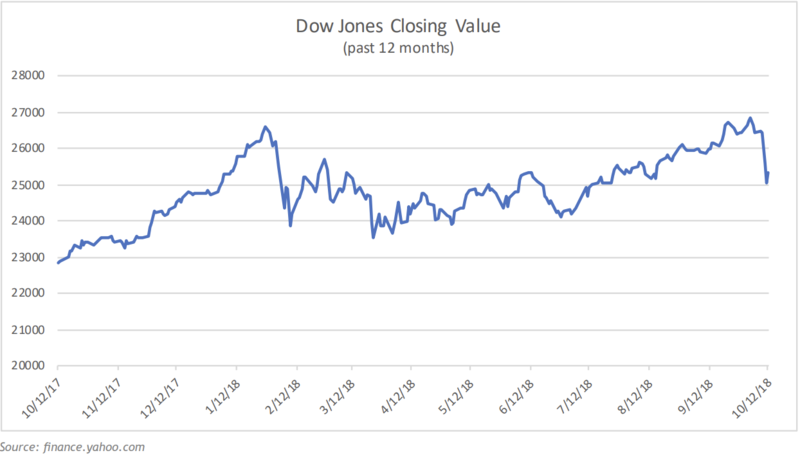 Given the market activity we are experiencing this month, we thought it would be a good opportunity to share our views and hopefully provide a little useful perspective and insight. In short, we really view this as a natural and probably necessary pullback in the markets. Through September 30th, US stocks were up more than 17% over the past year and a pullback was inevitable at some point. We do not try to predict or manage portfolios to avoid market declines, as we firmly believe they are not predictable. While not predictable as to timing, we also know they are inevitable. Market volatility and corrections are part of what contributes to positive expected return premiums for stocks. At times like this, we try to remind investors of the importance of focusing on the long-term and trying hard to tune out the short-term noise. 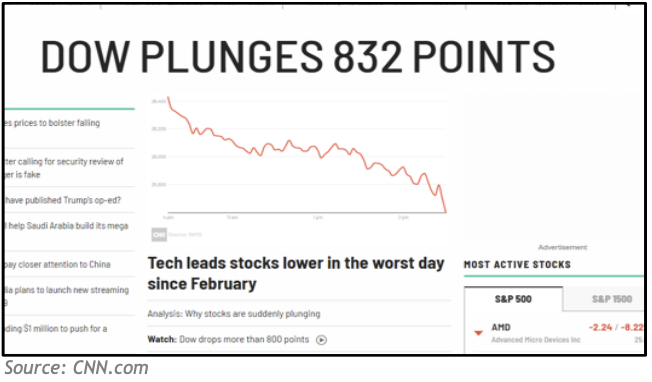 We recognize that as investors, we are all facing a barrage of influences that may push us off track, with the news networks being a key source. We pulled down a handful of screenshots from various websites on Wednesday, as an example of what we are up against as we seek to serve and educate our clients. It is important to note that these sites have their own agenda and goals. Their objective is to pull readers into their websites, read their articles, get clicks, and earn advertising revenue. Helping investors reach their long-term goals is not their priority. The language and images play on the fears and anxieties of investors. While these natural human reactions and impulses are useful in many situations, and worked to keep our ancestors safe from danger, reacting to them in relation to an investment strategy has proven to be detrimental to investors. we see that last week’s move takes the Dow essentially back to where we were in the middle of August. 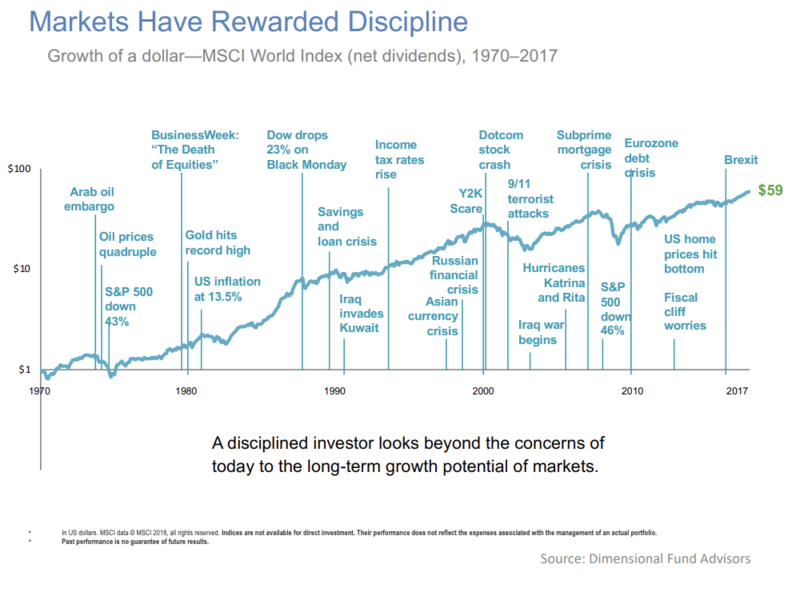 investors have been rewarded over time. It was certainly a challenging week for markets, and it won’t be the last. As to where we go from here? The truth is that we don’t know, and we don’t believe anyone can know. Ecclesiastes 11:2 - But divide your investments among many places, for you do not know what risks might lie ahead. process, and resist the base-level instinct to panic will ultimately be rewarded.